A walking guide to Berlin's famous boulevard, The Kurfürstendamm, highlighting events. people and places from the heady days of the Weimar Era and beyond. My husband and I love Berlin and have been a few times, but now want to return with this book in hand. The book is to the point and covers so much history and art in such a small, short book. A wonderful travel companion to a very exciting street in history. I can so easily see my great uncle's place in the Berlin at the time with all those other creativity artists. Franz Wachsmann (Waxman) played piano for the Weintraub Syncopators, played in the Tingle Tangle Club, and played piano for Trude Hesterberg, as well as Marlene Dietrich. It was Friederich Hollander who invited him to Paris to score 'Lilliom' which saved Franz's life and enabled him to come to Hollywood, where he made his name in the film industry to make enough money to sponsor his parents and sister to come to Hollywood. Franz's sister was my grandmother, and her daughter was my mother. I was born in Hollywood, thanks to my great uncle and the cabaret scene in Weimar Germany! An evocative and moving account of the people who lived and worked on this famous boulevard in such an interesting city. 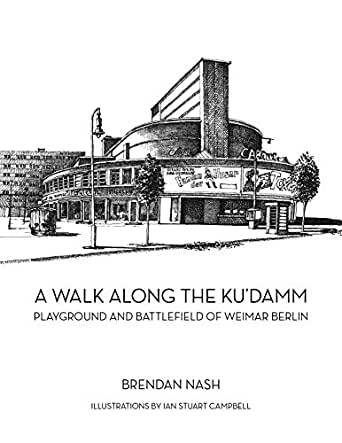 I have recently been in Berlin but would like to go back now with the book in my hand and stand outside all the places mentioned to pay homage.